Before I get into the saga of my race today, a quick recap. Bike racers are divided into categories based on number of races they have been in, races they’ve placed in, etc. The lowest category is 5, which would be pretty much anyone who walks in off the street — i.e., me. Categories 1,2,and 3 are highly skilled amateurs or professionals. When I went to register for the Hillsboro-Roubaix, I was presented with a choice. There was a men’s cat 5 division, and there was a men’s Masters over 50 division. “Masters”, of course, means “old.” The cat 5 men raced the loop twice, for 44 miles total. The masters raced the loop three times, for 66 miles. I might point out that the only other people who raced 66 miles were the men and women cat 1-3s. I decided I’d rather race 66 miles with old fogeys than 44 with young cat 5s. In retrospect, maybe not the wisest choice. The masters 40+ and 50+ all started together. The first 22-mile lap was insane. Interestingly, about half of those masters were cat 2 or 3, and they set a killer pace. Furthermore, there was a 15-20 mile an hour wind, with higher gusts. I hung with the pack for about 5 miles, and then picked up some people in a pace line for another 5. Then I fell off the back of the pace line like I was riding through glue. So did another guy shortly after, and we rode together a while. The first lap wasn’t too bad, still. My time was pretty good. About 14 miles in, the cat 1-3 women passed me like I was standing still, and as they went by, a woman in the back of the peloton yelled “Hi, Dr. Gathman!” I was puzzled. I caught up with her at the end of the first lap as we went through town. A former student named Kristen Diehl who used to babysit for us back in the early 90s, it turns out. She’d seen my name on the registration list and was looking for me. Otherwise it would have been REALLY puzzling how she recognized me in passing with a helmet and sunglasses on. I remembered her, but only after she introduced herself and provided me with some background info. The last two laps I was alone the whole way. The guy I’d been with dropped back when I was climbing a hill, and I never saw him again — he had been talking about maybe quitting at the end of the lap. For a while groups of riders from other divisions that started after mine passed me occasionally. By midway through the third lap, I wasn’t seeing anyone else. I was also starting to get major cramps in my right thigh. I was determined to finish, though. Almost exactly 4 hours from my start time, I crossed the finish line. My teammate Don was there with a camera to record my triumph. It turns out it was not merely a personal triumph, but a major cycling distinction. When I got off the bike and started back to my car, I realized they were taking down the scoring tent. I was the last rider to finish. As they say in the Tour de France, the Lanterne Rouge. I’m so proud. I have a feeling I’m going to be really sore tomorrow. Next time I’m riding with the cat 5s, even if they’re 30 years younger than I am. All the years I’ve been wandering around in the outdoors, and it’s the first time I’ve ever seen turtles doing it.Â Right outside the window of my classroom. I don’t know how long they’d been at it when I came upon them, but it lasted at least another ten minutes after that — enough time to go to my office and get the camera and come back, anyway.Â Interestingly there’s no perceptible motion while they’re mating. Something’s going on, but you’d have to be one of them to be able to tell, I think. My eldest daughter Cabell has an extensive web presence, including photos on Flickr, a livejournal blog, myspace, facebook, twitter, and a blog on her own dedicated site. (Okay, I have all these things too.) I find it comforting in a way to be able to find out what she’s up to by visiting her various web presences, and we stay in communication pretty much daily by commenting in each other’s blogs, etc. Nevertheless, when she said in her latest blog entry “…I have identified another group with a special appreciation for my hair: exotic dancers…,” it did give me pause. When I read further about “..an interesting difference between professional dancers and the women who participate in amateur night…,” I have to admit that I started to wonder exactly what Cabell might have been doing there on amateur night. So when the FBI comes to your house with a search warrant and they cut open your mattresses, can you get reimbursed for the damage? I suppose it’s unlikely to happen, but it’s just happened to Nick Nolte in Mullholland Falls. Next Saturday is the Hillsboro Roubaix. As I’ve mentioned earlier, they have a division for 50 and over, and I did register for it. This is a 66 mile race, and although the other 16 guys registered for this division are, by definition, also old farts, they’re probably all in better shape than I am. I figured this weekend was my last opportunity to get a long training ride in. So, I did a 62 mile ride, starting at home in Pokey, then to Oak Ridge, Jackson, Tilsit, Whitewater, Crump, Burfordville, Millersville, and back through Oak Ridge to Pocahontas again. The entire ride is hills, especially the Whitewater to Burfordville section, which goes over a big ridge with some steep grades. Anyway, it went fairly well, but I’m clearly not any threat in the Hillsboro Roubaix unless the other guys have beer bellies. Meanwhile, there are some important sights on this route. 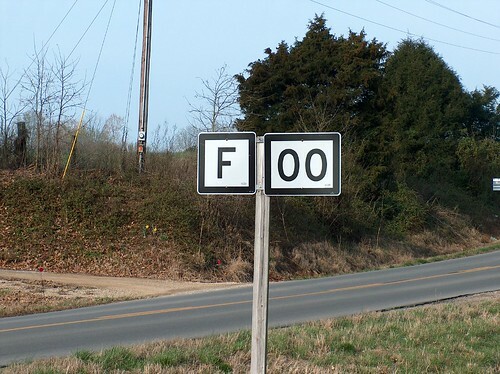 Yes, this is FOO junction. Just south of Tilsit. Anyway, now I’m back, and I’m really sore. And I’m making lamb korma. With homemade naan. *And no, it’s not ironic, and the people who live there aren’t black. I saw a black guy while I was riding through Millersville the other day. He was doing some surveying for the electric company, and I was thinking that he’d be the bravest man in Millersville at the moment if it weren’t for the fact that I was wearing spandex. View from Sophie’s window of one of the minaret houses across the street. Sophie at the Como Park Conservatory. Sophie at work at the Children’s museum. Bob the Builder on the Scrambler.Â As the sign says, you can’t climb on this.Â In fact, it’s not good for anything.Â Poor children. Today Sophie had to work (at the Minnesota Children’s Museum, where she is now a Floor Captain), so I spent a fair amount of time just hanging out.Â I did go to Grand Avenue to look for something for Binnielula (shhh).Â And I did a little home repair job.Â Sophie and Chloe have an old clawfoot tub that the landlord has converted to a shower.Â It has a racetrack-shaped copper tubing hung from the ceiling that holds up the shower curtain.Â The tubing has two vertical pipes that are attached to pipe brackets screwed into the ceiling.Â Only thing is that one of those pipes isn’t really so much attached as just stuck in with a moderately tight friction fit.Â Sophie warned me before I took a shower that I shouldn’t be surprised if the shower curtain fell down.Â It did. Twice.Â And basically just from the weight of water on it. First I tried to tighten the set screw that holds the pipe in the fitting, but the threads in the fitting were stripped out.Â So I bought some heavy-duty fast glue and managed to rig a way to hold it up temporarily with a coat hanger while the glue dried.Â It seems to have worked, at least temporarily.Â It would have been better to replace the fitting on the ceiling, but I don’t travel with sufficient tools for that. Anyway, then I went to pick Sophie up from work, where I got to see her in full uniform (purple vest).Â I also got to see Earth World, complete with ant tunnels for the kids to crawl around in, and the Bob the Builder room.Â And “raceways”, where there are bunches of ramps that you can roll golf balls down and have them do cool stuff like loop-the-loops and so on. Now Chloe has returned from taking an Anatomy and Physiology test, and we’re all going to go out to dinner.Â Tomorrow I head home, a lovely 11 hour drive. So this morning Sophie and I went to the Como Park Conservatory and Zoo.Â Unfortunately the Sunken Garden was closed, as they’ve just taken down the Winter Flower Show and are about to put in the Spring Flower Show.Â The rest of the conservatory was pretty neat, though.Â It was a little odd, too.Â As Sophie and I walked around the greenhouses, she kept pointing out amazing cool tropical plants, and I kept saying, “Oh, yeah, we used to have one of those in our yard when I was a kid.”Â Growing up in south Florida is weird.Â People have hedges that are made out of what you later find out everyone else in the country thinks of as houseplants.Â Â Meanwhile, the birds, trees, and mammals in your Little Golden Guides are mythical creatures from fairyland, for all you know. They also had a really nice exhibit of tropical flora and fauna, all in a semi-realistic rain forest setting.Â Lots of cool fish, insects, snakes, etc.Â And a sloth. Then we went over to the zoo and looked at the primates and big cats.Â Both were pretty depressing, because it’s obviously really boring being a primate or big cat in the zoo.Â Especially in Minnesota in March. Then we went to Mai Village and ate Vietnamese food for lunch, which was very good.Â After a brief rest back at Sophie’s we went to the Science Museum and saw an Imax movie: Vikings- Journey to New Worlds.Â That was pretty cool; I’d never seen an Imax movie before.Â And it made me want to visit Iceland, which looks beautiful. Then we went to the Central Public Library and Sophie got some books.Â All in all, a fun day in Good Old St. Paul. Well, as you might expect it’s crazy dealing with all the hordes of other Spring Break visitors to the Twin Cities, but I made it.Â So now I’m at Sophie’s apartment, and we just got back from eating Ethiopian food and I’m stuffed. I used MapQuest and decided to take its advice and come via Iowa; usually I would go through Illinois and Wisconsin, which is longer but all on interstate highways.Â The Iowa route actually turned out to be quicker, but it was substantially more stressful.Â I kept thinking I was lost.Â The damn MapQuest directions insisted on referring to each road by the most obscure possible designation.Â So if the road is I-380, and also US 218, and also Iowa 27, and also County Road 243a, Mapquest refers to it as County Road 243a.Â Since the signs are often only the top-level designation, I’m driving along going “Oh no! This is I-380 and I’m supposed to be on County Road 243a!”Â So I had to stop at exits frequently to figure out if I was in the right place. Still, I got here, so I guess it worked okay. Oh, yeah, I know that those of you who wait anxiously for each missive will have been suffering terribly.Â I’ve been a) covering Walt’s classes while he was out of town for almost two weeks and b) frantically preparing chromosome assemblies so that our PI can show them off at the Fungal Genetics meeting in Asilomar. Want to see what I spend my time on?Â Here are the first two fully assembled Coprinus cinereus chromosomes.Â Only 11 more to go.Â Click on the “examples” links to see stuff. You are currently browsing the Allen Gathman blog archives for March, 2007.